The IJOY Captain PD270 TC BOX MOD is powered by dual 20700 batteries, with maximum 234W output power. 510 thread and 0.96-inch OLED display. It supports VT(Ni/Ti/SS)/TCR Mode and Firmware Upgradable. Available in Black, Gun, Rainbow, Yellow, Blue and Red colors. The IJOY Captain PD270 TC BOX MOD is powered by dual 20700 batteries, which also can be powered by dual 18650 batteries with adaptor. The total battery capacity is 6000mAh and the maximum output power is 234W. 0.96-inch OLED screen offers the easy operation and the compact size makes the mod easy to carry. The Captain PD270 Mod features NI/TI/SS temperature control and TCR function, and the unique custom user mode is amazing! 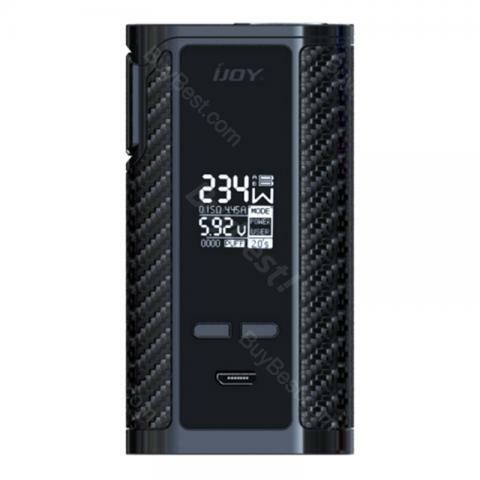 Firmware Upgradable is possible for this IJOY Captain PD270 TC BOX MOD and you can choose one favorite color from Black, Gun, Rainbow, Yellow, Blue and Red. • It comes with 2 pieces of 20700 batteries. • It is also compatible with 18650 batteries with the 18650 adaptor. This mod has been performing really well there, especially in terms of battery life. All good, fast delivery. satisfied with the Ijoy. It is a great addition to my mod collection! For those who love to put something in and out of the pocket, they could not like it, but think about the long battery life and secure flip design and clear screen. It's not even a thing!